So you've taught something new. Whether it was to your whole class or to a small group, whether it was the introduction of a new reading strategy, a step in the process of writing an organized paragraph, or how to differentiate between two tricky spelling patterns, you did it. You've done the modeling, you've guided them through some examples, and now you want to give your students a task with which to practice what you taught them. You could give all your students the exact same task and send them back to their seat while you sit at your desk and bask in the glory of your engaging lesson. But what might work better, what might allow the task to benefit each and every student and the various levels of understanding they have at this moment, is to differentiate the task. Yeah right, you scoff. In a dream world. Who has time to do that? At least, who has time to do that consistently? This strategy is one of my very favorites. It works best if the teaching part of your lesson has been done in an area of the room where students are not at their desks. Maybe you've gathered the class near an anchor chart in the corner, or maybe you are working at the kidney-shaped table with a small group. As you transition from the teaching to the task, send students off to work BUT invite them to stay with you for a few extra minutes to get started, if they need it. It might sound like this: "Boys and girls, if you feel like you're ready to give this a try, go ahead and get started at your desk. If you need some help getting started, you can stay here with me." The differentiation comes in because of your extra guidance with the group of students who stay behind. The great thing is, as soon as you release students to work, you are left with exactly the students who need additional help, ready to go. No moving around, no time wasted figuring out who should stay. 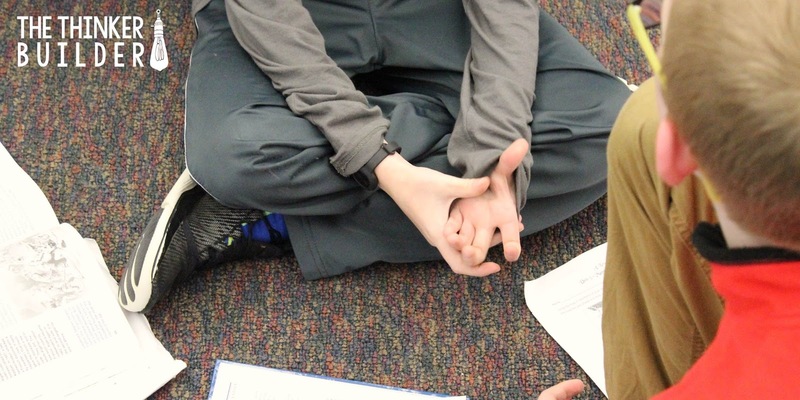 Pairing students who have a limited understanding with students who have a better understanding is a common way to differentiate a task, but it's important to be mindful of your higher achievers' needs, too. I often prefer to have students find a partner with a similar level of understanding, creating a more equal partnership for the task. Then I can float around to the pairs who might still struggle. How to do this quickly? Before starting the task, ask students to think about how confident they feel in the skill, on a 1 to 3 scale. Hold that many fingers up and find a partner with the same number. Sure, it takes some trust in students' ability to self-assess, but it puts some purpose behind the partnerships. Arranging students in small groups can also work well. Institute a few simple procedures: "Boys and girls, work independently at your table group. If you need help, say to your group, 'I need some coaching on such-and-such. Is anyone available?' Remember that coaching is not the same as giving the answer." This small-group-coaching structure works really well during a math assignment. With tasks involving writing, it can be helpful for some students to "talk it out" prior to writing. Try having students turn to a neighbor before beginning the task and talk about their thinking for a moment. Depending on the task, it might just be reading the directions out loud to each other, or maybe brainstorming a list of the steps for completion. Sometimes a partner isn't even necessary. I've had students benefit from simply saying their thinking/answer/idea to the wall prior to writing it down. Yes, literally, to the wall. They get up, go over to a wall, and quietly talk out loud, listening to how their own words sound, rehearsing what they are about to write. Consider alternative options for students to record their thinking. Of course this depends on the skill or strategy being practiced, but allowing students to show you through a drawing, a labeled drawing, a drawing accompanied by a written description, a graphic organizer, or some other combination of drawing and writing, can often eliminate (or at least decrease) the "double jeopardy" of not only completing a task but also doing it through writing (which can often be just as much of a struggle as understanding the skill/strategy in the first place). Modeling these techniques during your lesson will help students use them well on their own. Adding an element of drawing isn't just a way to differentiate a task down, either. For students who are able to record their answers in writing right away, try requiring them to then choose the best way to graphically organize their thinking, whether it's a t-chart, web, flow chart, or a way of their own, this extra metacognitive step gets students thinking about their thinking, solidifying their understanding further. 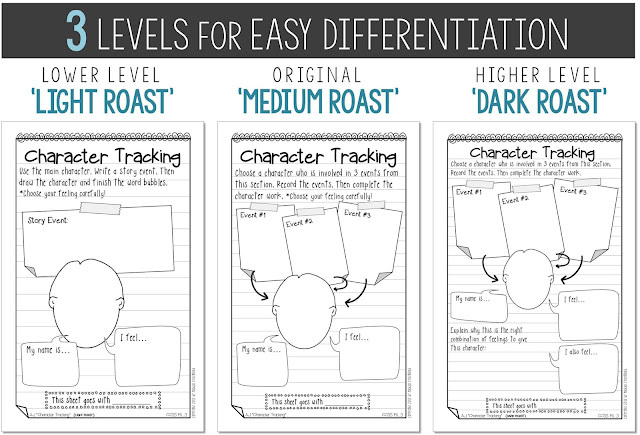 For reading tasks, try using different levels of text to differentiate, rather than changing the task. Have higher students complete the task with a harder text, and lower students complete the task with an easier text. If the topic of the text is irrelevant, you could have students simply use the text from their current guided reading group. Or consider having some students use a text they've previously read, helping them focus on the new skill and less about understanding the new text. Completing an entire task on a new skill may be overwhelming to some students, so asking them to check-in with you after doing part of the work will break a big job into more manageable pieces. It also allows you to steer them back on track if needed. A check-in is also an easy way to differentiate for your higher kids. It gives you a chance to push them farther and challenge them to think deeper in ways you weren't able to do during a lesson to the whole class. Often, many students will quickly complete the initial task you give for them to practice. You might normally have separate, unrelated activities for these "early finishers" to do while the rest of the class keeps working. But instead, could this be an opportunity for these students to take the skill/strategy one step further? Without any additional prep, have these students apply the new skill/strategy to something in which they have choice. If it's a reading skill/strategy, could they apply it to the self-selected book they are reading? If it's a writing skill/strategy, could they apply it to their own piece of writing they've been working on? Of course, sometimes it sure is nice to have a task that has differentiation already built into it. If you're interested in reading response pages that come in three levels of differentiation, you may want to look into my Reader's Notebook Response Pages. I have sets available to use with Literature and with Informational Text. As you see in the example above, the each response page comes in three versions, each at a different level of sophistication. 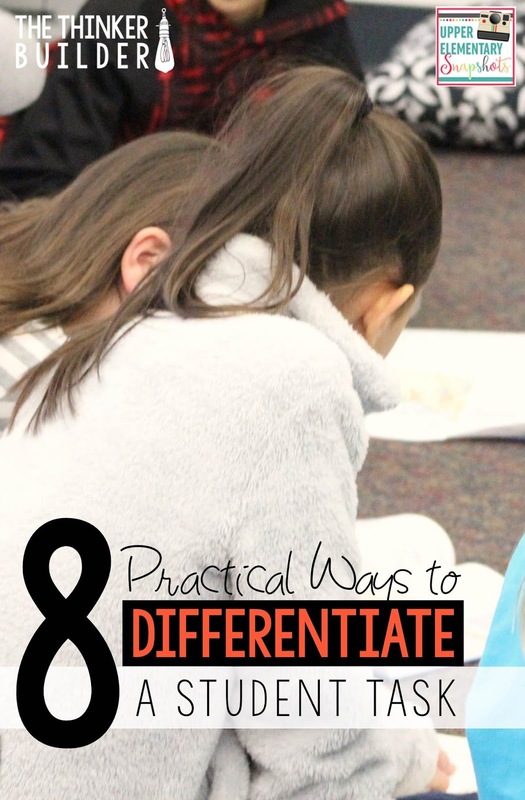 Using a method of differentiation, maybe one or two of the ones mentioned here, will help you provide a more meaningful task to each student, one with the right amount of support where by doing it, all students move forward. 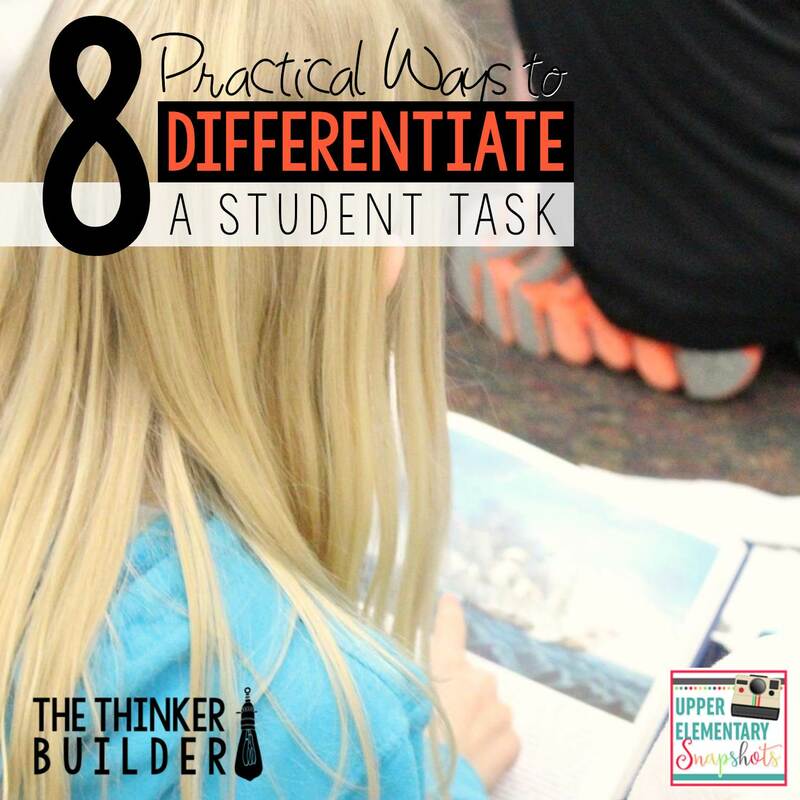 How about differentiating your whole group instruction? Could you use some ways to do that? 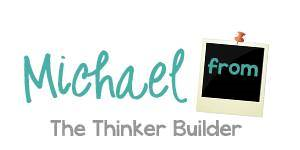 I've got nine of them over on my blog, The Thinker Builder.